Ever since the 2008 financial crisis it seems as if the world has been living through a strange new economic paradigm. A decade ago, few people could have predicted six years of near-zero interest rates in the United States, negative rates in Switzerland and Japan, and the persistent sluggishness of economic growth throughout the world. Economists disagree over the cause. Is it secular stagnation? A savings glut? Or the result of supply-side productivity challenges? Potential solutions are even more hotly contested. Are we living in a new normal, or is it time to examine other ways to measure and encourage progress – both social and economic? Perhaps now is the right time to turn away from the all-consuming focus on macroeconomic analysis and concentrate on what really underpins development. The complexities of the 21st century require new measures of progress. Relying only on a country’s wealth or gross domestic product creates an incomplete picture of human and societal advancement. Getting rich will not solve current social challenges. To drive sustainable and equitable growth we need to focus on measurements which go beyond GDP. In the last eight years, U.S. unemployment is down and the economy has generally improved, but polls consistently show that Americans don’t feel better off than before the 2008 recession. In Europe, growth has been sluggish and many Europeans believe their children will fare worse than they did. Monthly jobs reports, stock market gains and GDP growth are all important, but in terms of moving the economy forward and advancing social progress these indicators are not getting the job done. It is time to chart a new course and take a holistic view. On June 29 the Social Progress Imperative released its annual Social Progress Index. Using only societal and environmental measures, the index provides an authoritative view of the things that matter most to people in 133 countries, covering 94 percent of the world’s population. Even in its third year, the results offer revealing details about the world we inhabit and advances being made toward greater social progress. This year’s index shows that the world as a whole has improved its social progress score slightly. The average social progress of every person on the planet is equivalent to that of Mongolia in Central Asia. The world is performing best in categories such as nutrition and basic medical care and access to basic knowledge, due in part to the focus on these two areas by the Millennium Development Goals. However, the world scores more poorly in the areas of personal rights and tolerance and inclusion. The Nordic countries of Finland and Denmark, long lauded for impressive levels of development and social cohesion, took first and third place in this year’s index. Canada, with a large geographic area and a more ethnically diverse population came second, showing that there is more than one formula for achieving high levels of social progress. One of the least satisfying findings is that young people are bearing the brunt of development failures. Nearly half of those under the age of 24 live in low-social-progress countries, often with inadequate medical care, clean water, safety and freedom. This raises concerns not only about the quality of daily care young people are receiving, but also about their ability to acquire the skills the workforce of the future will demand and will better their lives for the long term. Though fiscal and monetary policy can steer the economy, the foundations of growth have largely remained unchanged over the past century: innovation supplied by an educated and healthy workforce; investments made by people who have confidence in a country’s legal system; and entrepreneurs living in a free and tolerant society with adequate infrastructure on which to build businesses. This is not to sideline or ignore economic data and policies, but to put a country’s societal well-being on an equal footing. The Social Progress Index helps us do this. Beyond national rankings, it provides each country with a scorecard identifying its strengths and weaknesses, based on comparisons with countries with similar levels of per-capita GDP. It highlights success wherever it exists and shows that societal improvements can be made at every level of development. Weaknesses are then really opportunities – by working to improve them countries can create a better environment. One in which people are better able to engage in the economy with more of the resources they need. Additionally, the index can act like a sort of roadmap, helping to take politics out of the equation when making investment decisions with taxpayer money. Business can play a role as well. Companies are increasingly measured and evaluated by more than just financial and economic indicators. Many chief executives understand that doing business better not only improves returns, but helps restore public trust in business and adds value to society. By collaborating with governments and non-profit organisations to create and fund innovative social policies, business can help secure long-term economic growth. Social advancement and economic development are dependent on, and enhance, each other. Neither should be ignored in favour of the other. The question is whether we are doing enough to advance both. 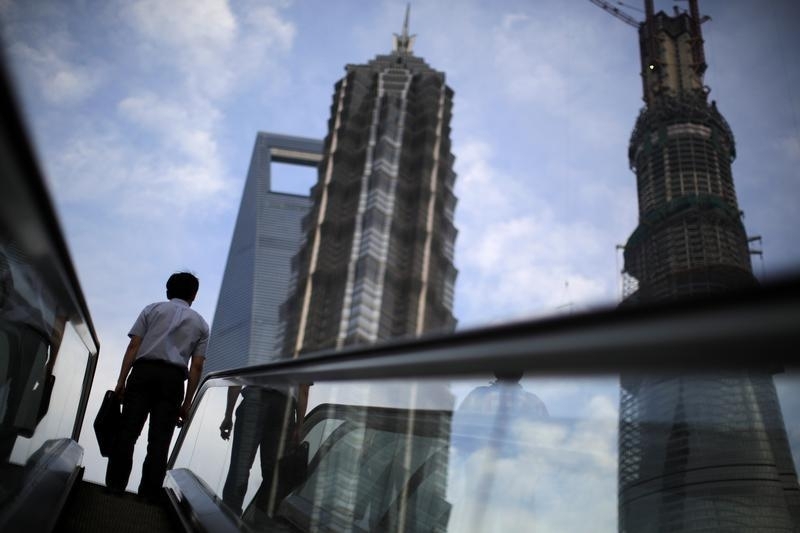 A man rides an escalator near Shanghai Tower (R, under construction), Jin Mao Tower (C) and the Shanghai World Financial Center (L) at the Pudong financial district in Shanghai July 4, 2013. David Cruickshank is the global chairman of Deloitte Touche Tohmatsu Limited and serves on the board of the Social Progress Imperative.